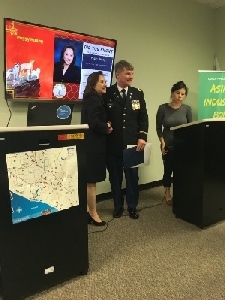 IRVINE, Calif., Nov. 16, 2018 /Christian Newswire/ -- The California State Senate and the Yorba Linda City Council each honored Chaplain (MAJOR) James F. Linzey, USA (Ret.) with a Certificate of Recognition at a post-Veterans' Day Dinner on November 14, 2018, for his outstanding service to the United States Armed Forces as a Military Chaplain. The event was sponsored by Asian Industry Business and Words of Comfort Hope and Promise, and it was hosted by the PGA Tour Superstore in Irvine, California. Photo: Chaplain Jim Linzey with Councilwoman Peggy Huang of the Yorba Linda City Council after Jim's acceptance speech. Chaplain Linzey served his country honorably for 24 years in military service beginning in 1985 with the United States Air Force before transitioning to the Army in 1998. Assignments included serving as the chaplain for the largest Mobilization and Demobilization mission in the continental United States at Fort Bliss, TX, which was a Division-level assignment. He also served as the first full-time chaplain for the Leader's Training Course in 2006 under the US Army Cadet Command at Fort Knox, KY.
Jim is currently a highly sought-after speaker for crusades, conventions and seminars, and has had numerous radio, TV and movie appearances. Jim is the author of Moral Leadership, A Divine Appointment in Washington, DC, and The Holy Spirit. He is also heavily involved in Bible translation work, partnering with Charisma Media. Recently, Jim served as a contributing author for Indivisible Devotions, released by Sony Pictures. Currently, Jim serves as a volunteer co-pastor for the Airman-Marine Memorial Chapel, in support of the Command Chaplain, MCAS Miramar, San Diego, CA; and as Chaplain for the California Military Officer's Association of America; and as Chaplain for the Association of the United States Army, San Diego Chapter. He also supports the Marines at Camp Pendleton through a highly effective partnership with Words of Comfort, Hope and Promise for which Cynthia Martinez serves as the president. Jim is the president of the Military Bible Association, Inc., and he is an ordained minister in the Southern Baptist Convention. Jim is one of the sons of the US Navy's Mother of the Fleet, Verna Hall Linzey, who was awarded this honor for building the US Navy's largest Sunday School program at NAS Moffett Field. She was the great, great grand-daughter of George Hall who was an Army Chaplain in George Washington's Continental Army; the wife of Captain Stanford E. Linzey, Jr., CHC, USN, who was the first active duty Navy chaplain representing the General Council of the Assemblies of God; the mother of three military chaplains who served in the Air Force, Army, and Navy; and the grandmother of a Navy chaplain. She was also made an honorary Military Chaplain by the Coalition of Spirit-Filled Churches, but ordained by the Assemblies of God and the Southern Baptist Convention. She, like her son Jim, was involved in the movie, television, and recording industry. Both had a role in the movie Iniquity--Jim as a Military Chaplain, but Verna as the lead juror in a court scene. State Senator John M.W. Moorlach, of the 37th State District provided the Certificate of Recognition from the California State Senate, and Peggy Huang provided the Certificate of Recognition from the Yorba Linda City Council.